Graves in the Blackwood Cemetery. 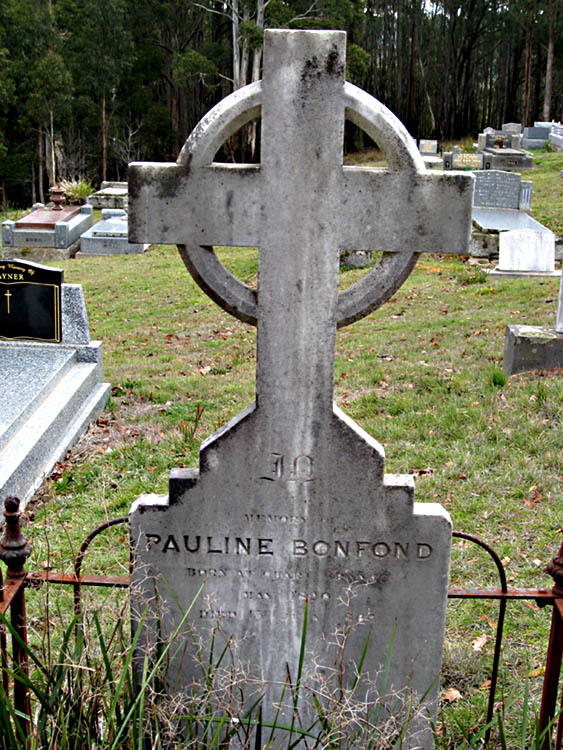 PAULINE BONFOND – DIED BLACKWOOD, 15th July 1867. A newspaper article states “Madame Pauline Bonfond, a French woman made an excellent living contracting to cut races for the diggers. She built the water races for sluicing gold around the hills on the opposite side of the gully from Golden Point, Blackwood. The story states that many a thievish miner carried the marks of her shovel to their grave, when they thought they could get the better of her.” She was said to have sold the water in her race for a shilling for so much water for sluicing. 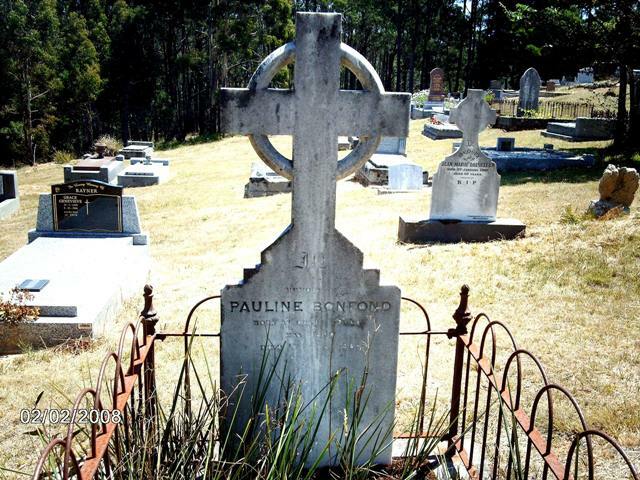 Her headstone reads – “Pauline Bonfond, Born in Chart, France May 1820, died 15 July 1867 age 47 yrs” -. She is buried in the Roman Catholic section M allot. 48, in the Blackwood Cemetery. Research shows several official records have conflicting names and records. Shipping records from the Public Records Office shows a Mr & Mrs Bonneford arrived in Melbourne from France in January 1855 on board the ‘Admiral Baudin’. Mrs Bonneford was listed as age 39 yrs (making her born 1816) with her was her husband age 43 yrs. The 1869 Mt. Blackwood Directory has Pauline Bonnefond listed as a race owner. This was two years after her death, but sufficient to show that she was listed as a race owner, and her name was then shown as Pauline Bonnefond. The research into the history of Pauline Bonfond has been difficult because of the variations of the spelling of her surname. In the micro-fiche death records she is listed as PAULINE BOUNEFOND died age 52 yrs, (making her born 1815), father listed as Antonio Jumentier, certificate no.7733. This date of birth matches her age on the shipping record. After paying for and obtaining the death certificate of Pauline Bonfond, the following information was obtained. Her surname was listed as BONNEFOND and her father, Antonio Jumentier was a farmer of Chart, Department of Seine et Aise, France, mother’s name unknown. Pauline Bonnefond’s husband was named as Pierre Bonnfond, she married him at age 25 yrs in Paris, France, she had no children. She is recorded on this certificate as having died at Golden Point Blackwood, on the 27th July and buried on the 29th July 1867 age 52 yrs (not 47 yrs nor the 15th July at stated on headstone). Cause of death was cancer of the transverse colon of 2 yrs duration, doctor was Samuel Smith Surgeon, and the informant was J. M. Loiseleur, miner, a friend of the deceased. The registrar was David Grieve Stobie and the undertaker was Frederick Chenu. Pauline was recorded as being born at Chart, Department of Seine et Aise, France, and being 12 years in the colony of Victoria (making it 1855, which matches the shipping record). It does not appear that her husband was with her at the time of her death, as he was not listed as the informant, and she was working to make a living for herself as a Race Owner. No other record could be found of Pauline or her husband’s Pierre Bonnefond’s, death record. The above shows that not all official records have correct spellings of names nor dates, and as hand writing on certificates is hard to read one can see the possible reason why this is so. There were said to be between 80 to 100 miles of water races on the Blackwood Goldfield. Figures published by the Mines Department show that Blackwood was very close to having the longest mileage of water races of any mining field in the Colony. Many of these water races can still be seen around Blackwood, and a track beside the races can provide a pleasant level walk where not overgrown by the invading bush. Some of the races have been restored as a bush walking track which provides a pleasing long or short walk through the Blackwood country side, where evidence of gold mining can be seen.